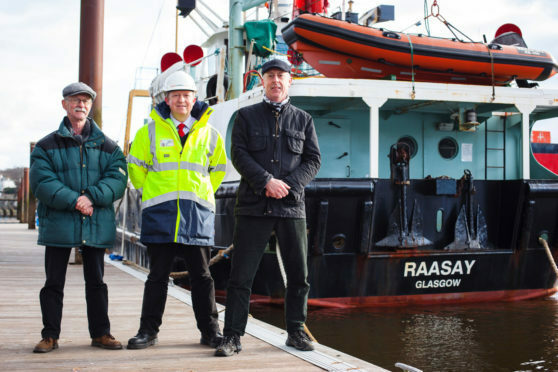 Gordon Law (left) and Stuart Craig of the Clyde River Steamer Club joined CalMac’s small vessel technical superintendent, Jonathan Davies for a last look around the vessel. After 21 years going over the sea to Skye (and then back to Raasay), this island ferry has done its bit. Caledonian MacBrayne’s MV Raasay served the Sconser to Raasay route since it was launched in 1976, until increased traffic from the island made her unsuitable. She then became one of the fleet’s relief vessels until being pressed back into regular service again in 2003 as the winter ferry serving Kilchoan-Tobermory. The vessel has now been handed back to owner Caledonian Maritime Assets Ltd (CMAL) and are expected to announce a buyer for it shortly.